Three years ago, a math teacher from the United Nations International School (UNIS) -- named Jamie Dougherty -- went to Nepal and was deeply impacted by her experience. She couldn’t shake what she saw in Nagarkot, Nepal that summer; children going hungry and villagers without an education. So Jamie came home and started a club at UNIS -- a school that revolves around global cultures and giving back to communities in need from all around the world -- focusing on the impoverished people of Nepal. The Nepal Club flourished at UNIS, and over the last three years they have created and started a meal program in a Nepalese elementary school which feeds 60 children lunch every single day. My kids are lucky enough to go to UNIS -- my son is in 1st grade and my twin daughters are in 6th grade -- and they have been involved in these important programs. The club is currently fundraising to rebuild a school that was destroyed in the 2015 earthquake. Every year, 20 UNIS students go to Nepal to teach the students in Nagarkot and bond with the community. 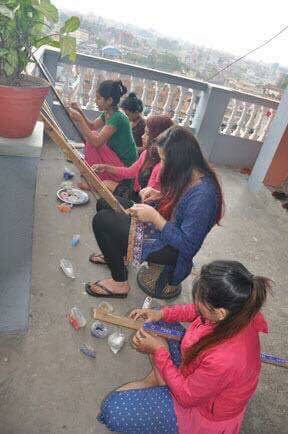 In conjunction, the club started a new project -- the empowerment of the women living in the villages. Currently, most of the women are either farmers or clean houses since they are from the "untouchable" class. These jobs pay so little that the girls would not be able to afford an education. The Nepal Club teamed up with the local Nepalese nonprofit Himilayan Voluntourism which provides raw material to the ladies and they use their creativity to design and make purchasable goods such as bags and cashmere pashminas. Every year the students of the Nepal Club travel to Nepal over spring break and bring the goods back to NYC and sell it at their school. All the profits made go back to these wonderful causes. I wanted to expand their ability to sell so they will host a table here at apple seeds on Saturday, May 20th for us to help them with their cause. If you can't make it this Saturday morning, we will keep the gorgeous handmade products at our front desk all week. Please stop by and check them out…and support this incredible, student-led effort for this amazing cause! !